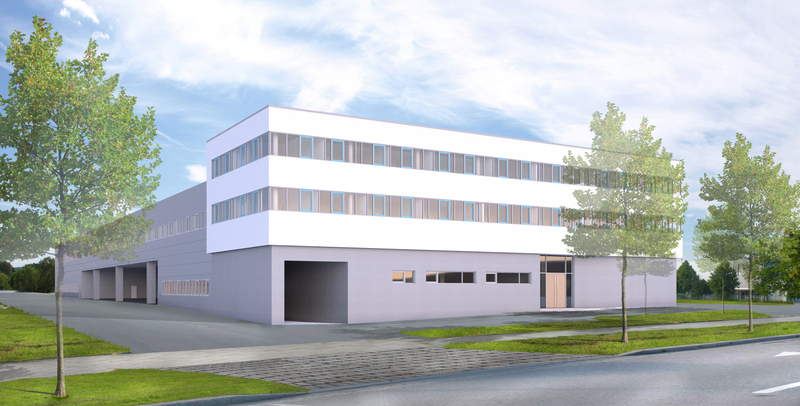 Garbe Industrial Real Estate GmbH is developing a state-of-the-art production hall in Eching near Munich for the broadcast technology provider sonoVTS. Construction of the property began in February. As of the end of 2018, the company intends to design, install, and store equipment for television and radio productions, multimedia, as well as complex broadcasting systems, studio equipment, and broadcasting vans in the new hall. The property is being built on a plot of land of almost 10,000 square metres, which Garbe Industrial Real Estate GmbH has taken over on hereditary leasehold. “It is one of the last larger, still unused areas in the Eching Business Park East,” says Jan Dietrich Hempel, managing director of Garbe Industrial Real Estate GmbH. The production building for the transmission technology specialist sonoVTS will have a total usable area of ​​around 7,800 square metres. The hall itself covers about 3,700 square metres. It is intended to have a clearance height of ten meters, so that a nearly 2,600-square-metre mezzanine for a workshop, various social, office, and meeting rooms can be accommodated. In addition, about 1,500 square metres of office space will be created in an extension in front of the hall. The building should be completed in October 2018. Thereafter, Garbe Industrial Real Estate GmbH will lease the production centre to sonoVTS for an initial 20 years. “In the long term, one of the world’s leading broadcast technology companies will move into the company’s real estate,” emphasizes Jan Dietrich Hempel. The labour market will also benefit from the project development. “The commissioning of our new production site in Eching will create up to 110 jobs,” explains Franz Olbert, managing director of sonoVTS. The location is about 25 kilometres north of Munich. The A 9 motorway, which connects Berlin with the Bavarian state capital, is nearby, as is the A 92 motorway from Munich to Deggendorf. Munich Airport is 15 kilometres away.